Command V 1st ever live show! Command V played their debut live show on August 25th in New York City. Stay tuned for details of their debut single Lost On Me coming soon with remixes from Jacques Renault, Optimo, Mighty Mouse, Night Plane and Max Pask. 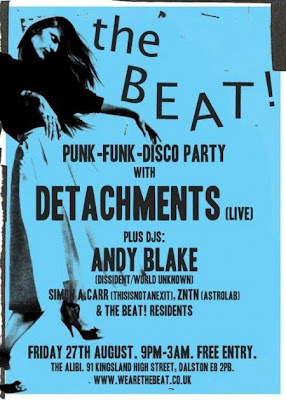 Detachments LIVE and Simon A. Carr DJ set at The Beat (The Alibi) Friday 27th August. Free entry. Detachments live at The Alibi in Dalston Friday 27th August. Free entry. Holiday Romance out 6th September. Debut album out 20th September. On tour from 21st September. This week sees the release of The Dark Esquire's Lexicons. Featuring the single version, plus an instrumental dub edit and remixes from Italians Do It Betters PREMIER RANG and Detachments its available only from Junodownload. We've still got a few copies of Situation available from the Thisisnotanexit store so if you have't got one go get as its the only way to get the 12" version of Situation and the CFCF and Crimea X Remixes. Tomorrow evening I'll be warming up for the Detachments live show at The Big Chill House with a bunch of post punk and minimal wave records. I packed this track last night when I was sorting through some records. I've been loving it all week after rediscovering it on the Creatures Of The Night Optimo podcast. Optimo have basically taken a scalpel to the A Day Remix - taken out the gothic overtones - and ramped up the screeching best bit. An example of what re-editing can achieve! This is most certainly in the bag for tomorrow night for when the dancefloor gets going. You can get it on this LP as you shouldn't DJ out with 160kps MP3's. We'll start this off with saying sorry about Friday night and The Drop being closed down by the council a few hours before the THISISNOTANEXIT party. A total nightmare. Still, we'll have Night Plane back over soon for a live show and keep you abreast of Thisisnotanexit events. For those who needs their THISISNOTANEXIT live fix then there are two London based events over the next couple of weeks which are of note. 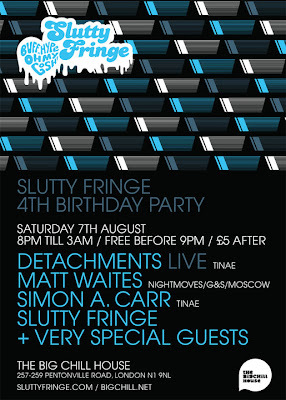 First up is the Slutty Fringe 4th Birthday Party at The Big Chill House on Saturday 7th August. It's almost a Thisisnotanexit party as Detachments will be playing live and myself and Matt Waites (aka Moscow) will be DJing alongside the Slutty Fringe people. Moscow remixed Detachments Fear No Fear and has been a friend of Thisisnotanexit from the start so should be a blast. I'll be doing the early shift from 8.30pm spinning weird synth records, post punk and minimal wave. Proper DJs and proper beatmatching later on after Detachments. Then on Friday 13th August Detachments head South to play at the quite awesome World Unknown party in Brixton. Hosted by Andy Blake and Joe Hart and playing the sort of music Thisisnotanexit wholeheartedly approves of. I'll let them tell you what the score is. 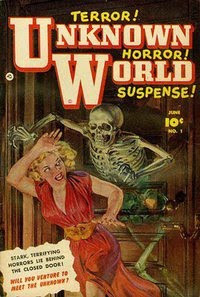 World Unknown is a monthly session with a soundtrack that takes in elements of Belgian new beat, EBM, electro, acid house, synth wave, techno and dark balearic, and hangs out somewhere in the territory inhabited by Ron Hardy's wild, kinetic take on house in its prototype form at Chicago's legendary Muzic Box circa '83-'86, alternative dance mecca Medusa's in Chicago during roughly the same period and later and the sound of Belgian clubs Boccaccio, Carrere and Ancienne Belgique in the mid to late 80s. Naturally Andy and Joe bring things bang up to date with their own unique take on things, digging deep into their expansive, labour-of-love record collections for those gems that nobody else is playing...yet. Andy Blake has remixed Detachments new single Holiday Romance into an 18 minute 1 take acid house groove that was exclaimed by the Slutty Fringe guys to be the remix of the year. So watch out for that out soon. Somehow everything on this post links all together. Beautiful. And that folks is that.